Dubai, United Arab Emirates, April 3, 2019: Huawei Consumer Business Group (CBG) unveiled the much-anticipated HUAWEI P30 Series to consumers in the Middle East and Africa region during a launch event that took place in Burj Park where the audience was treated a mesmerizing animation and lightshow projection on the Burj Khalifa. Lojain Omran the prominent TV presenter and social media personality was invited to take the stage to talk about her hands on experience of the Huawei P30 Pro as she was one of the first users to try out the super camera phone and share her hands-on experience when it comes to its fantastic camera and the optimized Snapchat experience. The HUAWEI P30 Series is set to change people’s expectations of smartphone photography. 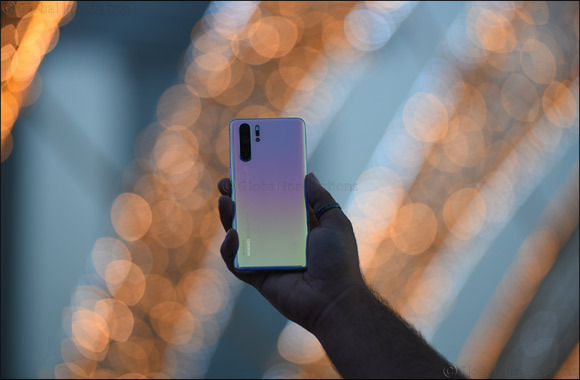 Huawei also announced that it has worked to optimize the Huawei P30 series camera for Snapchat, bringing more camera innovation to users, aiming for Snapchatters to soon be able to enjoy more experiences using the Huawei P30 camera. Combining exquisite design and innovation, Huawei also launched the HUAWEI P30 Lite in the region. The smartphone comes armed with a 32MP 3D Selfie Superstar camera integrated with AI Beautification which works like a professional team to enhance users’ beauty. The rear of the device features a 24MP AI ultra-wide triple camera comprising of 24MP main camera with a f/1.8 wide aperture lens, 8MP camera for ultra-wide angle shots and 2MP lens. In order to deliver a seamless user experience, the smartphone is launched with the EMUI 9.0.1 installed and offers 4GB of RAM and 128GB of internal storage. The device also features a 6.15-inch Dewdrop display and achieves a massive screen to body ratio of 84.1 percent. HUAWEI P30 Lite continues excellence in design and features a slim 3D curved glass exterior that provides a modern feel that smoothly merges with Huawei’s core innovations to deliver a premium and sleek user experience. HUAWEI P30 Lite will be available in two colors: Midnight Black and Peacock Blue. Huawei also launched the HUAWEI WATCH GT Active Edition and Elegant Edition. The outdoor smart watches feature up to two and one-week ultra-long battery life respectively, industry-leading fitness and wellness tracking capabilities, multi-sport modes and classic watch look with modern sensibility. The Active Edition features the same 46mm watch face and will be available in Black Stainless Steel, Stainless Steel. Pre-Orders: Both the HUAWEI P30 Pro and HUAWEI P30 will be available for pre-booking online and in-stores starting the 2nd of April 2019. For every HUAWEI P30 Pro and HUAWEI P30 pre-order, customers will receive a gift package worth of AED 1299, including the new Huawei Watch GT 2019 Active edition, VIP service and 6 months of screen damage protection. On-Shelf: HAUWEI P30 and P30 Pro will be available on shelves starting April 11th and HUAWEI P30 Lite will be available on shelves starting April 4th at Huawei Experience Stores and across key retailers. HUAWEI P30 Pro 8GB + 256GB is available in Breathing Crystal, Aurora and Black colors for the price of 3,399 AED. HUAWEI P30 Pro 8GB + 512GB in Amber Sunrise color will be available in mid-May and price TBC. HUAWEI P30 8GB+128GB is available in Breathing Crystal, Aurora and Black colors for the price of 2,599 AED. HUAWEI P30 Lite 4GB RAM + 128GB is available in Midnight Black and Peacock Blue colors for the price of 1,099 AED. HUAWEI Watch GT 2019 42mm Elegant Edition at the price of 799 AED.